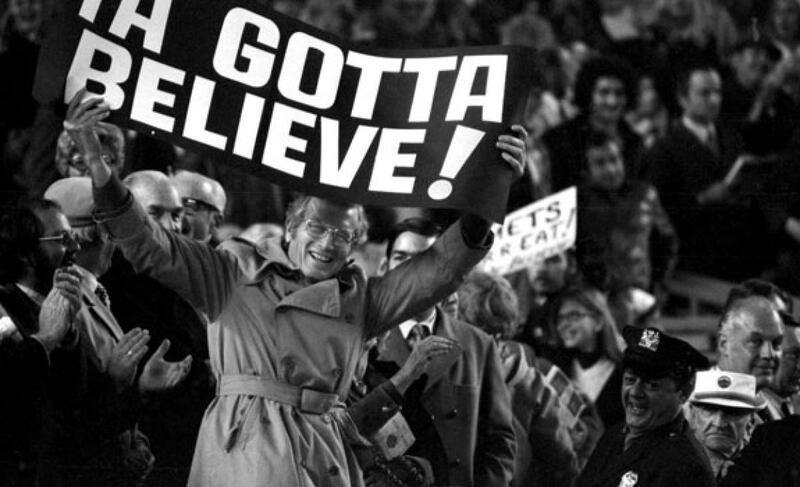 NLDS Game 3 Recap: Mets 13, Dodgers 7 | We Gotta Believe! The Mets defeated the Dodgers by a score of 13-7, taking game 3 of the NLDS to take a 2-1 series lead. The Mets fell down 3-0 in the 2nd, on a 2-run single by Yasmani Grandal, on which a 3rd run scored due to a Curtis Granderson throwing error. However, the Mets came right back in the bottom of the 2nd, scoring four on an RBI single by Travis d’Arnaud and a 3-run double by Curtis Granderson. From there, the Mets didn’t look back, scoring a postseason franchise record 13 runs (including 5 RBI by Curtis Granderson, tying a Mets postseason record). After both pitchers retired the side in the 1st inning, the Dodgers got to Matt Harvey with four consecutive singles in the 2nd, scoring 3 runs. The fourth single was a 2-run single by Yasmani Grandal, on which Curtis Granderson’s throw to 3rd got away, allowing a 3rd runner to score. Harvey got out of the inning, and the Mets came right back in the bottom of the 2nd. Yoenis Cespedes and Lucas Duda singled, before Travis d’Arnaud hit an RBI single to get the Mets on the board. Wilmer Flores singled to load the bases, and Brett Anderson got Juan Lagares to ground into a forceout at home. Matt Harvey struck out, but Curtis Granderson hit a bases-clearing double to right center, giving the Mets a 4-3 lead. Matt Harvey worked around a walk and a single in the 3rd, before the Mets tacked on 2 more with Travis d’Arnaud’s 2-run home run to left. The Mets had a 6-3 lead, and wouldn’t stop there. In the 4th, Juan Lagares led off with a double off of reliever Alex Wood, and with 2 outs, Wood intentionally walked David Wright. Daniel Murphy hit an RBI single to left, scoring Lagares, and setting up a 3-run home run by Yoenis Cespedes, a shot that landed in the 2nd deck. The Mets led 10-3. Harvey was finished after only 5 innings, allowing 7 hits, 3 runs (2 earned) and 2 walks while striking out 7. Bartolo Colon came on to pitch the 6th and struck out the side, but he allowed a solo home run to Adrian Gonzalez in the 7th. The Dodgers cut the lead to 10-4, but the Mets tacked on again in the bottom of the inning. After d’Arnaud, Flores, and Lagares loaded the bases with a single and two walks, respectively, pinch hitter Michael Conforto hit a sacrifice fly, and Curtis Granderson hit a 2-run double off the left field wall. The Mets had a 13-4 lead. Addison Reed pitched a clean 8th before Erik Goeddel ran into trouble in the 9th. Goeddel allowed consecutive singles before allowing a 3-run home run to Howie Kendrick. Another single signaled the end of the night for Goeddel, and Jeurys Familia got the next 3 batters to close out the 13-7 victory. POSITIVES: Curtis Granderson was 2/5 with 2 doubles and 5 RBI and continues his torrid postseason. Travis d’Arnaud came out of his funk nicely with a 3/5 performance with a home run, 3 RBI, and 3 runs scored. Wilmer Flores was 2/3 with a double, a walk, and 2 runs scored, and Juan Lagares was 1/3 with a double, as walk, and 3 runs scored. Yoenis Cespedes was 3/5 with a home run, 3 RBI, and 3 runs scored. Matt Harvey battled through 5 and Bartolo Colon was solid out of the bullpen despite giving up a solo home run. Addison Reed had a nice bounce-back effort. Jeurys Familia retired all 3 batters he faced. NEGATIVES: Erik Goeddel looked very hittable in the 9th, leaving his pitches up and allowing hits to all 4 batters he faced, including a 3-run home run. Lucas Duda looks lost at times, and was 1/5 tonight with 4 strikeouts (but he did have a single against the lefty Anderson). The Mets and Dodgers play game 4 tomorrow at 8:07 at Citi Field with Steven Matz facing off against Clayton Kershaw.